Grab your car, put the roof down, turn the speakers up, and get ready for a road-trip of a lifetime – we’re taking you to 10 of the most scenic roads in America. With beautiful coastlines, opulent National Parks, off-the-wall towns and cool wildlife, there’s so much to see and do on America’s incredible roads – and we’ve picked out the best of the lot. Where: This exquisite highway winds through the inhabited islands of the Florida Keys, starting in the southernmost leg of the Florida Peninsula and ending at quirky Key West. What: Journeying along the southernmost part of US Route 1 for 113 miles, this drive is certainly a feast for the eyes – especially for those who are fond of the big blue ocean. 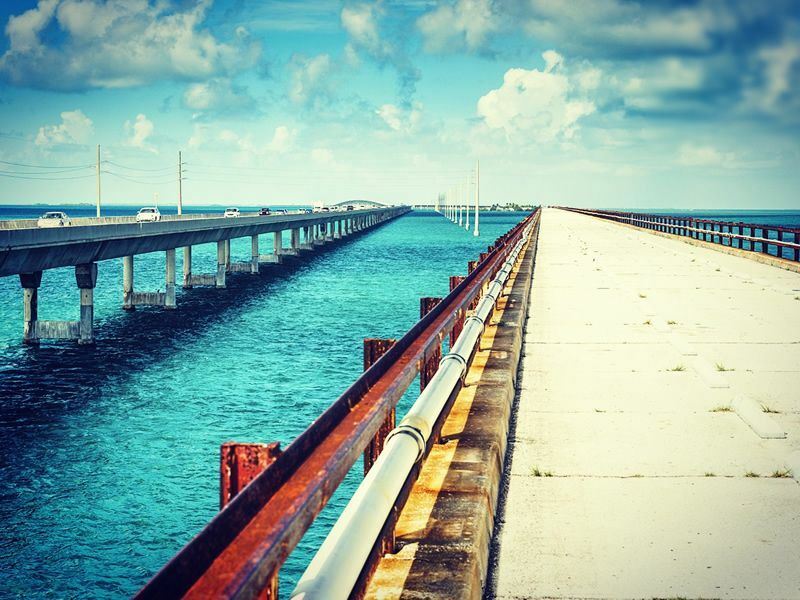 Glimmering emerald waters and countless colourful coral reefs can be seen for miles as you scoot your way across 42 overseas bridges, the most iconic of these being the seven mile bridge – you’ll feel as if you’re lost at sea as you travel across it. Thanks to this highway, the lively Florida Keys islets are much more accessible for travellers, and all have a unique personality to enjoy. Islamorada is perfect for budding fishermen, The Moorings is dotted with quaint, colourful cottages, and Key West is an energetic party island with quirky street entertainment you won’t want to miss. At the end of the road, why not sneak a taste of the iconic Key Lime Pie? Highlights: The sunsets in this area of the world are truly phenomenal, and a scene you’ll never forget as you drive across the wide bridges. The night sky is painted with bright pinks, purples, oranges and purples, providing a gorgeous backdrop for your scenic drive. Where: This mountain shrouded 469 mile drive connects Great Smoky Mountains National Park in North Carolina with Shenandoah National Park in Virginia. What: This winding path will grace you with truly dramatic scenery – think towering mountain ranges, sweeping vistas, verdant alpine forest, and incredible skylines. Following a snaking road lined by the soaring Blue Ridge mountain ranges, you’ll be able to witness the natural beauty of the Appalachian Mountains with your own eyes, and be part of one of the most visited sections of the National Park system. The outstanding scenery is by far the best part of this drive, which you can enjoy even more by stopping for a leisurely picnic, or camping within the luscious forests that cover the area in rich greens, reds and yellows. 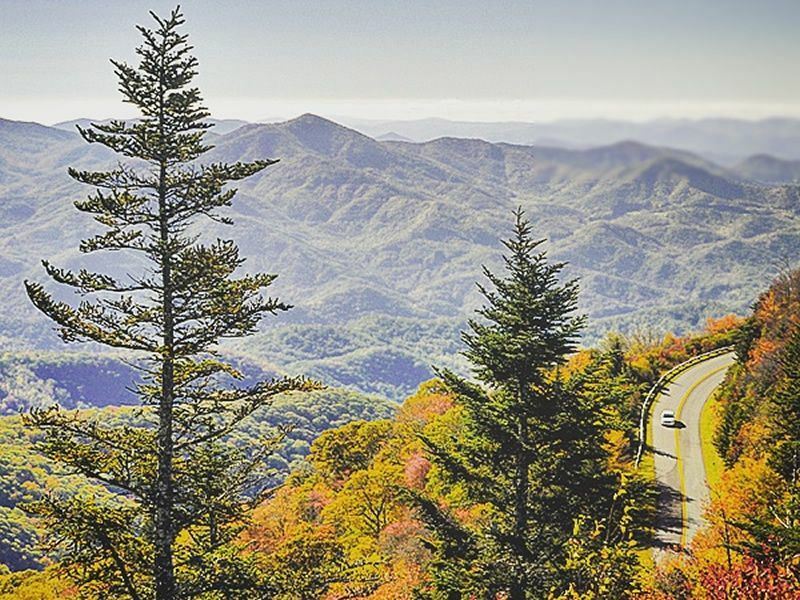 Highlights: We’re sure you’ve seen photos of the fantastic Linn Cove Viaduct, a twisting 1,243ft high bridge that bends and curves around the tree covered slopes of Grandfather Mountain in North Carolina. Truly breath-taking, not only will you marvel at the sheer height of the mountain edge you’ll follow, but also at the alpine forest and magnificent mountain peaks in the distance. Where: You’ll find this rugged drive nestled within Glacier National Park in Montana, crossing the Continental Divide through Logan Pass. 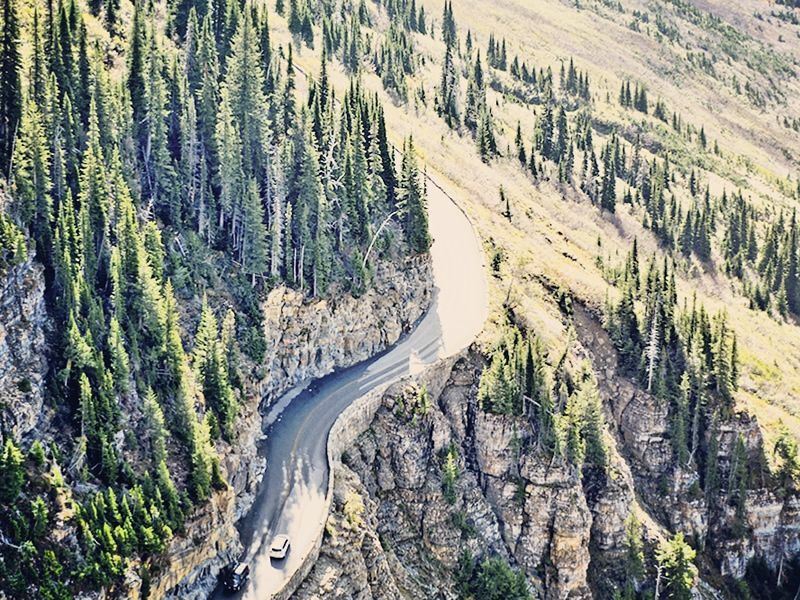 What: Wild, inspirational landscapes await you on this mountain road. Spanning the width of Glacier National Park between the east and west entrances, you’ll be met with a diverse range of dramatic backdrops, with plenty of pull-outs and vistas to stop at so you can really take in the park’s unbelievable beauty. Cascading waterfalls, icy glaciers, sweeping valleys and depth-defying gorges trace the journey for you, including the Weeping Waterfall – where water tumbles down the mountain wall next to your car – and the Jackson Glacier Overlook, which graces you with the best view of a enormous glacier. Highlights: If you fancy more of an insight into the park’s rich history, why not hop on a famous Red Bus? Created in the 1930’s, Glacier National Park operates 33 of the original vintage buses today, offering guided tours amidst the amazing park landscapes. What could be more laid back then pootling along in a vintage car with the roof down? Where: This colourful highway follows the Hawaii Routes 36 and 360, connecting Kahukui with the picturesque town of Hana, nestled on the island of Maui. What: Aloha! 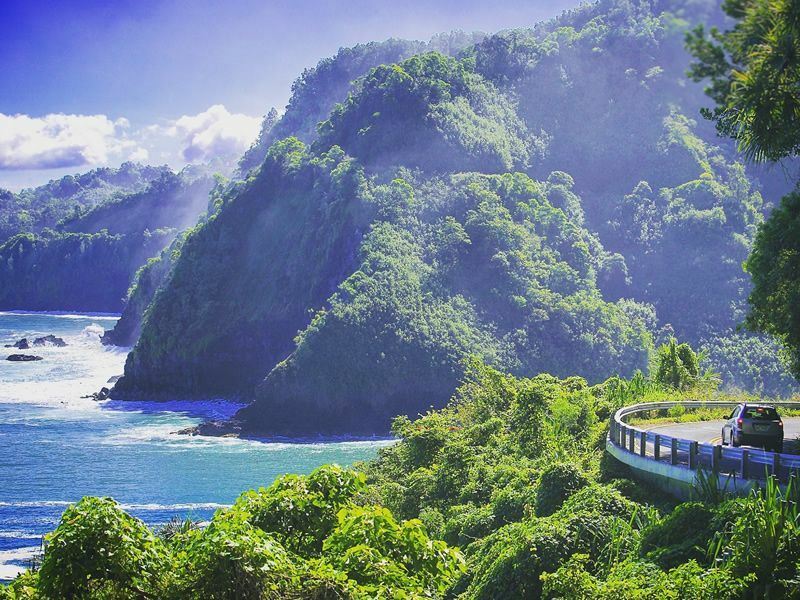 Lose yourself in the tropic oasis of Maui’s rainforest on this twisty-turny 64 mile road, shrouded by exotic trees and passing splendid waterfalls, unique black sand beaches and popular tourist attractions along the way. As you wind your way through these gorgeous landscapes, you’ll find yourself driving over 59 bridges, many of which date back to 1910, and travelling past picturesque vistas and lookouts – some with quirky attractions to explore. Early on in your journey towards Hana you’ll find nature trails, churches, natural pools, and plenty of food carts and cafes – be sure to try a deliciously fruity smoothie at Huelo Lookout, or tuck into Caribbean fare at Ka Haku Smoke Shack. There’s even the Garden of Eden Arboretum and Botanical Garden – a lush garden used as the opening sequence for Jurassic Park. Highlights: Ohe’o Gulch is loved by many, and for good reason. Also known as the Seven Sacred Pools, this is a real head turner – several small waterfalls gushing into dark green pools, surrounded by dense jungle and providing the perfect place to take a dip and cool off from the sun. Be sure to get here early to avoid the crowds, and enjoy a nice, relaxing morning in the natural pools. 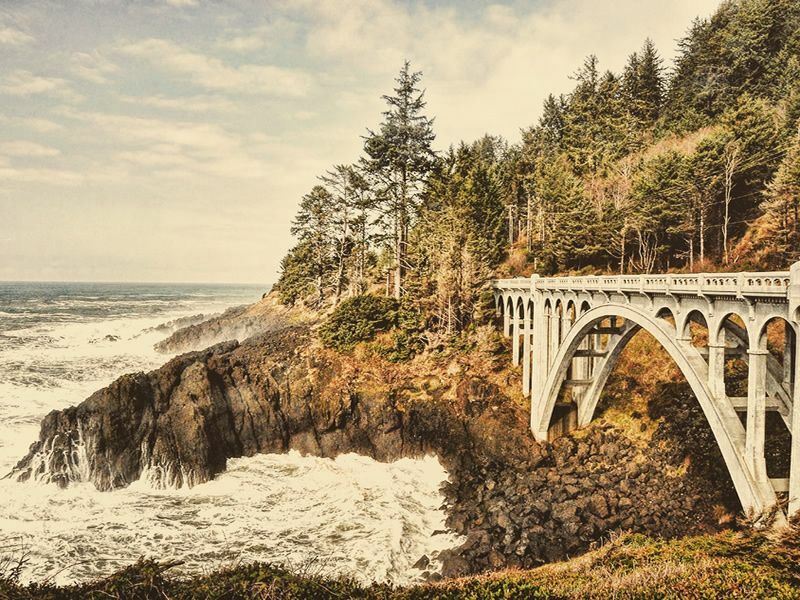 Where: This coastal drive is located on US Route 101, whizzing through Oregon along the rocky Pacific Ocean shoreline. What: Running from the Pacific Ocean to the Washington State line on the Columbia River, this picturesque route is truly laidback, and will be sure to give you those desirable beach holiday vibes – so pop the roof down and get driving. On one side you’ll be graced with magnificent mountain ranges, whilst on the other you’ll notice the sea lapping against the sand and rough rocks. Your journey will take you through plenty of quaint coastal towns, including the small fishing town of Port Orford and pretty Gold Beach, as well as leading you across the highest and grandest bridge in Oregon, the Thomas Creek Bridge. Highlights: Don’t miss the chance to see wild sea lions at the aptly named Sea Lion Cave. Around midpoint on the highway, take a break and saunter down to this fascinating system of sea caves and caverns, home to many of the majestic animals, and watch as they swim and sunbathe between the rocks. This is America’s largest sea cave and a privately owned wildlife preserve, offering sea lions a sanctuary to come to as and when they please. Where: Nestled in Alaska, this 368 mile highway connects the bustling cities of Valdez and Fairbanks. 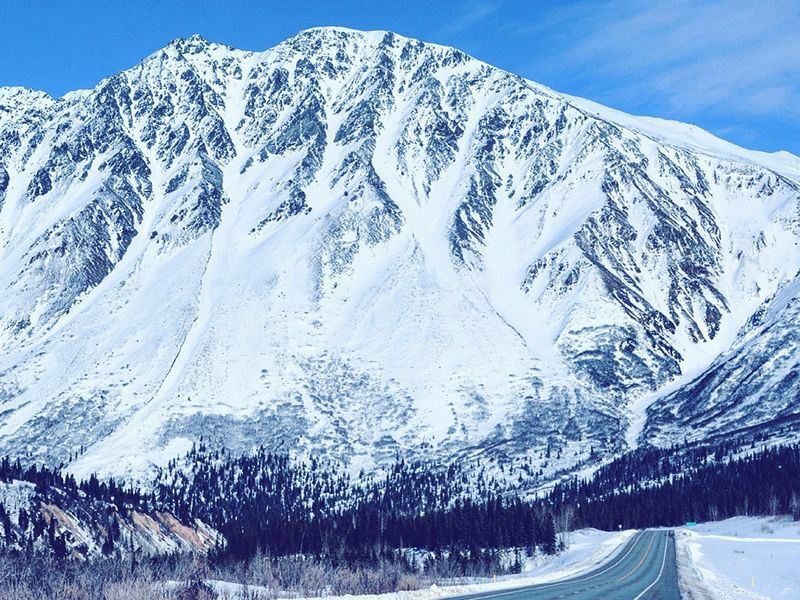 What: This highway is history in the making, boasting the first major road built in Alaska, as well as two stunning 100 mile sections that are designated State Scenic Byways. You can definitely see why – this wide open road offers incredibly rewarding views, leading you along straight and curvy roads towards gigantic snow-capped mountain ranges and through expansive fields. If that’s not all, we bet you’ll be amazed by the glaciers, alpine forests and elusive wildlife – this is certainly a feast for the eyes. Don’t forget to stop by Thompson Pass – the unforgettable Worthington Glacier can be found here. This astonishing glacier is one of few in the world you can drive to, so be sure to take advantage of this experience. Highlights: Turn off the ignition and grab a canoe – it’s time to explore the unforgettable ice caves at Valdez Glacier Lake. This is a fantastic chance to see an iceberg up close, with the amazing Chugach Mountains in the background. Exploring the waters that surround these icebergs is certainly something you’ll regret not stopping for. Where: This intricate two mile path sits in the Beaverhead Mountains – part of the gorgeous Bitterroot Range in the Rocky Mountains that lies on the Montana-Idaho border. What: Steeped in history and culture, this trail running through verdant forest and sweeping valleys is best known for being part of the Lewis and Clark Expedition in 1804. Follow the twisted path and witness the dazzling natural beauty the travellers would have seen on their trek, taking in the awesome views of jagged mountain ranges and the vibrant alpine meadows surrounding them. The Bitterroot Range is a marvel itself, creating a rugged landscape soaring high in the sky – try and spot the small, pink bitterroot flowers that bloom in the valleys. 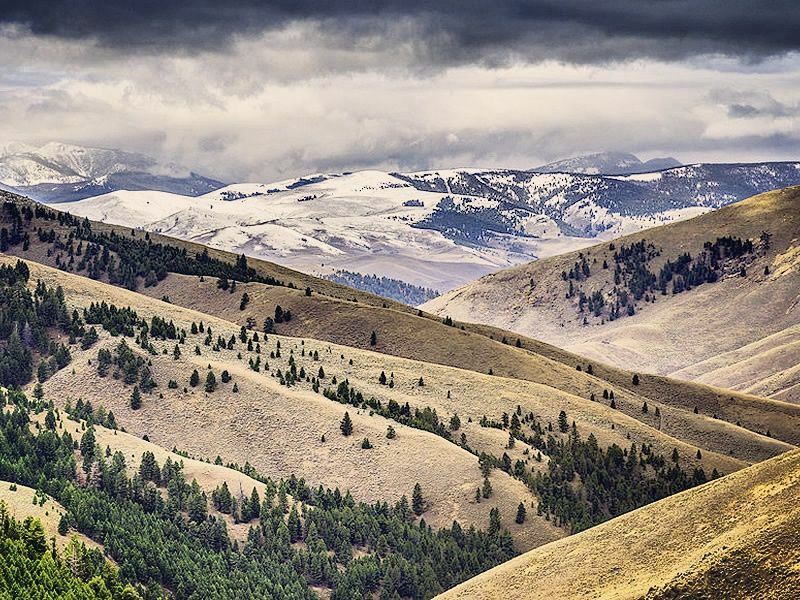 Highlights: Wander through the sweeping sceneries to find Lewis and Clark’s first Idaho campsite – this is the iconic spot where Idaho was first seen by the Americans, and the momentous views surrounding it will be sure to excite you. 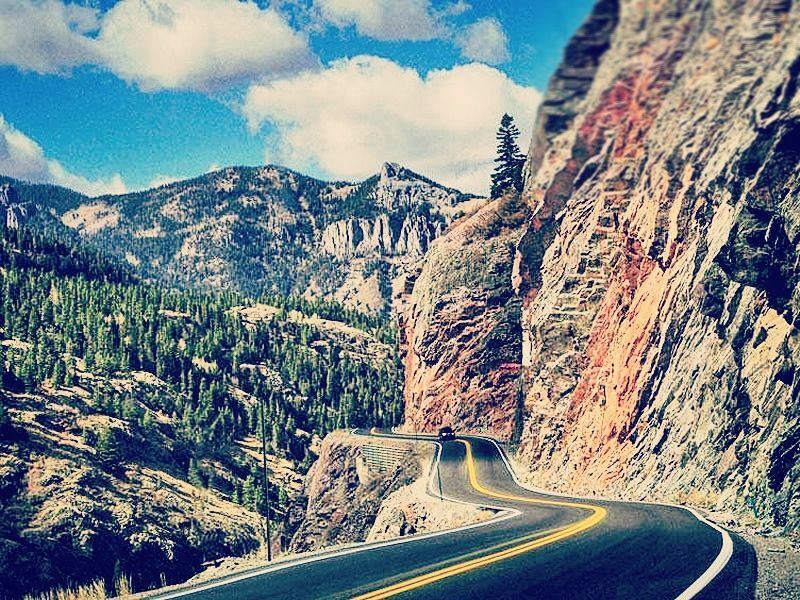 Where: This 233 mile looping road can be found in the southwest part of Colorado, curling its way through the heart of the San Juan Mountains. What: Colourful Colorado – an oasis of bright colours, admirable sceneries, and fantastic remote towns. You’ll see it all as you drive along this All-American road, journeying through the rich landscapes with tall mountain ranges, topaz lakes and dark green forest whizzing past your window. This route is best in spring, the small mountain towns of Dolores, Durango and Telluride awash with colourful trees and flora, and the San Miguel River flowing through the meadows. Definitely make a stop in Telluride at any time of the year – this world-class skiing resort is also home to lively jazz, film and bluegrass festivals in the summer. Highlights: For a unique experience, be sure to stop off at the archaeological site of Mesa Verde National Park. Home to the densest collection of prehistoric ruins in the US, you’ll be transported back in time to Ancestral Puebloan’s ancient homes, nestled in orange sand cliffs and packed with history and culture. Where: Sitting in the western State of Utah, the 51 mile State Route 143 links the cities of Parowan and Panguitch. 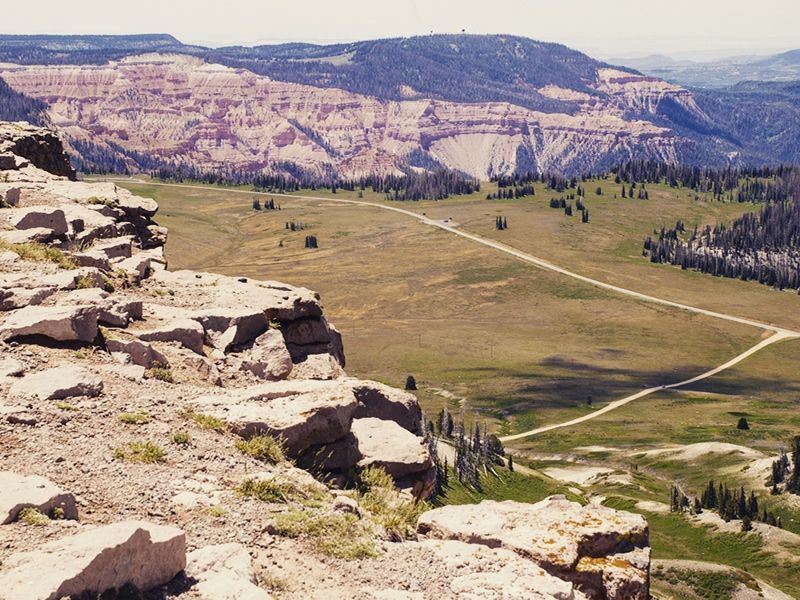 What: The stark contrast of the bright orange, rugged landscapes of Cedar Breaks National Monument, the picturesque ski town Brian Head, and the sparkling water and tall trees surrounding Panguitch Lake make this scenic route incredibly diverse. Weaving through Utah is a truly picture-perfect experience – historic towns, fascinating geologic formations, wildlife habitats and plenty of fun recreational opportunities await you wherever you turn. This particular route, though, takes you to the State’s most delightful areas, including the red Vermillion Cliffs, and the pink cliffs of Paunsagunt Plateau, offering a myriad of colours and landscapes. Highlights: With so many amazing sceneries, it’s hard to pick just one highlight. But we definitely suggest ascending Utah’s ‘Grand Staircase’ and taking in the unique sight of Cedar Breaks National Monument. These warm orange coloured cliffs drop 2,000 feet, offering naturally beautiful views of spires, arches, pinnacles, and intricate canyons. After an afternoon of exploring, delve into the verdant Dixie National Forest that surrounds the area for a few hours of hiking, camping, or picnicking. Where: This seaside route runs along State Route 1, winding 147 miles along the Pacific coastline of California on a major north-south state highway. 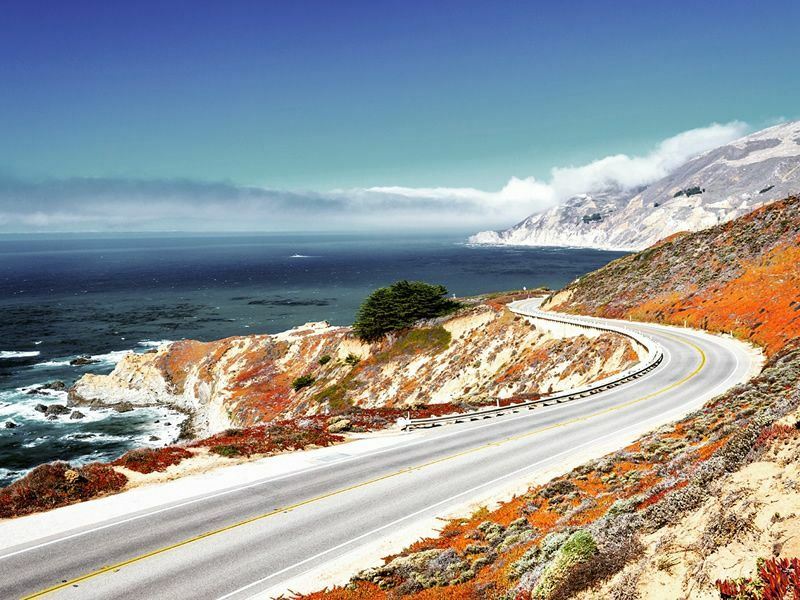 What: With wide open roads, awesome sceneries and brilliant stop-offs, this scenic drive from Carmel to Morro Bay really embodies the American road trip experience. Fancy riding on two wheels instead of four? 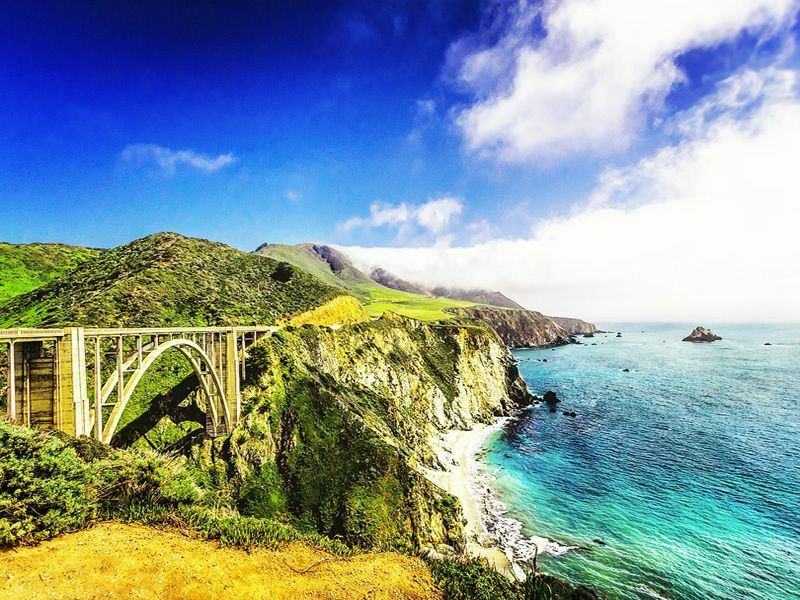 This is one of the top motorcycle rides in the US, offering the perfect terrain to whizz through wonderful Big Sur and enjoy the glistening sea views. It’s not just the coastline that will amaze you though – this route also threads though Monterey steeped in history, Carmel-by-the-sea with its charming, colourful cottages, and the rocky Garrapata State Park, home to cheeky sea otters. Highlights: As you’re speeding along the cliff hugging highway, be sure to take a turn to 17-Mile Drive, a spectacular road that hugs the shoreline and twists through Pebble Beach and Pacific Grove. Passing famous golf courses, mansions, one of the most photographed trees in America – Lone Cypress, and the dense Monte Forest with towering Monterey Cyprus trees, this is a fantastic sightseeing drive.